Hello, and welcome to my very first post on my shiny new blog! As an author I’ve always shied away from writing a blog for various reasons; mainly, who on earth would want to hear what I’ve got to say? But also – well, there are plenty of people out there writing blogs and doing them so well, what can I offer? 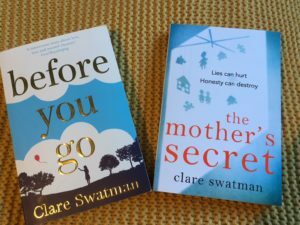 But I’ve finally decided to bite the bullet because, with the publication of my second novel, The Mother’s Secret, imminent, I thought I might finally have something interesting and/or useful to share with everyone – anything from how I write, to how I got published, as well as sharing all the books I’ve read and loved recently. Generally spreading the book love. So, here I am! For those who know me, my debut was published last year. I loved writing Before You Go, but everything was very new to me, and all very exciting and scary. This time round, things feel different, and I’m focusing more on getting my name known and trying to build this book-writing business into a proper career. The Mother’s Secret is very different from my debut. It focuses on a family with lots of secrets, and how they deal with the fall-out when those secrets are revealed. Some of it was quite hard to write, and other parts I loved as they involved travelling back in time to the 1970s, the decade when I was actually born. People often ask how I decide where to set a book. My first was set in London because, for the first one, I wanted to write about somewhere I knew, so it was mainly about places I’d lived or knew very well. This time, I chose Norwich and north Norfolk, mainly Cromer, partly because it just felt right for the story, and partly because I have family connections there. I spent many weeks as a child with my grandparents in Suffolk, and I now have friends in Norfolk and, although I didn’t know Cromer well, a research trip up there over a chilly few days in February was enough to help me get a feel for the place. Over the next few weeks I’ll talk a bit more about how I write; from plotting, to characterisation, to structure and more. But it’s worth remembering that everyone works differently, and what works for me might not work for you. With that in mind I’m also hoping to include guest posts from other authors, as well as the occasional review of a book I’ve recently read and loved. Until then, thanks for reading, and see you soon!